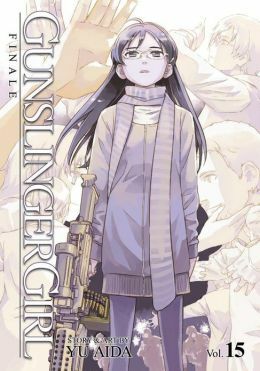 The final volume of the Gunslinger Girl manga arrived today. The first surprise were the words “heartwarming conclusion” in the blurb on the back cover. The second surprise was that Yu Aida really did pull it off (perhaps the third surprise is seeing Jean finally treat Rico as decently as she has long deserved). God, I’m a softie, and I’m sure all the Kool Kids will snicker, but I found this final volume to be a fitting conclusion — the complete opposite of the carnage and mayhem of the previous volumes. Yes, it has its melancholy aspects, and many beloved characters do not survive the series, but it really does end on a note of hope as the weeks of bloody terrorism give way to a peace movement with echoes of the one that emerged in Northern Ireland, and the Social Welfare Agency takes on a new role. This volume, called “Finale”, brings the series to a close, showing the fates of the survivors, and laying many ghosts to rest, giving each a witness to recognize their passing. I’ll agree that the epilogue lays it on way too thick, but for Triela, I’ll forgive almost anything. I’m so glad that Seven Seas picked this series up from ADV Manga, and saw it through to its conclusion. In twenty years of manga reading, this series stands out in the way it breathes life into its characters as it tells their stories. Aye. The epilogue and the final chapter really brought the series to a nice close. Brought me to tears reading this volume Finale. Yes. It’s been clear for a while that the climax of the previous volume was on its way — both in shape and results. What was surprising was the way this volume concludes the series so well. I did not see this ending coming. It’s always been hard for me to pick my Top 5 favorite manga, but never my #1 Favorite. That’s been, without a doubt, Gunslinger Girl for the longest time. Yeah, I’m still amazed that this got printed in English to the end. License rescues are rare, but when they do happen (as with GSG and Yotsuba&), at least it’s for titles that are incredibly deserving.